Parameters achieved so far in the various FRC facilities range from 5 x 1019m-3 to 5 x 1021 m-3 in plasma density, 3keV ion temperature and 0.5 keV electron temperature, plasma beta in the range 0.75-0.95. The high values of plasma density are particularly remarkable although obtained in first-generation, short-duration experiments. As the configuration lifetime increases, the trend is towards lower density. Typical values of rs/ rc are in the range 0.4-0.6, although values up to 0.9 have been achieved. Elongations in the range 3 to 10 have been obtained. Values of the Lawson parameter nr as large as 1017 m-3 s have been obtained. • BN (TRINITI Research Center, Troitsk, Russia). This facility (l = 0.9 m, rc = 0.21m, B = 0.45 T, r = 50 ms) has investigated improved control techniques, internal magnetic field structure, and electron energy distribution. It has also been used to form different magnetic configurations (spheromak and tokamak). • TL (TRINITI Research Center, Troitsk, Russia). This facility uses independent active end control coils for dynamic formation and has investigated start-up methods with different timescales. • TOR (TRINITI Research Center, Troitsk, Russia). This facility (l = 1.5 m, rc = 0.3 m, B = 1T, r = 100 ms) has investigated the strong heating that occurs during start-up. • NUCTE-3 (Nihon University, Japan). This facility (l = 2m, rc = 0.16m, B = 1T, r = 60 ms) has investigated the global mode dynamics and the control of the separatrix shape by auxiliary coils. The effect of a multipolar field on stability and confinement has also been investigated. • FIX (Osaka University, Japan). This facility generates FRCs (using a 0-pinch source) that are then translated in a large chamber where they expand. The reduction of density following the expansion (5 x 1019 m-3) enables the use of neutral beam injection [Okada et al., 2005]. • TS-3/TS-4 (Tokyo University, Japan). The TS-3 facility has been employed for the formation of a variety of magnetic configurations (FRCs, spheromaks, and ultra low-aspect ratio tokamaks). FRCs have been formed by counter-helicity merging of two spheromaks (the helicity concept is introduced in Section B.3.3.4). 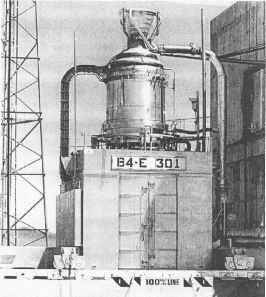 TS-3 has recently been upgraded to the TS-4 facility [Kawamori et al., 2005]. • LSX/mod (University of Washington, USA). This is the largest FRC facility in the world (l = 5 m, rc = 0.9 m, B = 0.8 T). It was converted into a TCS facility (with a confinement chamber at the end of the translation section) to perform experiments on controling separatrix shape and to start-up and sustain rotating magnetic fields [Hoffman et al., 2004]. This facility should provide information on MHD stability at larger values of parameter S (lower values of p*). The STX (University of Washington, USA) facility (l = 3 m, rc = 0.4 m, B = 0.2 T) is called the Star Thrust Experiment [Miller et al., 1998] and is partially funded by NASA to investigate applications to space propulsion, such as by using rotating magnetic fields. Very powerful (but short-lived) rotating magnetic fields will be used to overcome the ionization and radiation barriers that have so far limited the use of this technique to low-temperature plasmas. • MRX/SPIRIT (Princeton, USA). The Magnetic Reconnection Experiment (MRX) can generate spheromaks, low-aspect-ratio tokamaks and FRCs. SPIRIT is a proposal to investigate MHD stability and confinement over a wide range of S (1-15) and elongation (0.5 < l/2rs < 4). On a longer timeframe, neutral beam injection could be used. • FIREX (Cornell University, USA). The Field-reversed Ion Ring Experiment injects an ion beam from a diode through a magnetic cusp to form an ion ring that should carry a large fraction of azimuthal current and provide stability. • ROTAMAK (Flinders University, Australia). In this facility, spherical FRCs have been produced and sustained up to 40 ms using up to 200 kW of rotating magnetic field power. The amount of current driven is at present limited by available power. • FRX-L (Los Alamos) is a compact plasma injector to study high-density FRC formation, stability, and translation physics, in preparation for its eventual use to demonstrate the physics of magnetized target fusion. Very high average densities (up to 4 x 1022 m-3) have been achieved with a (ion plus electron) temperature of 500 eV. Liner implosion tests have been carried out without plasma. Integrated plasma/liner experiments are scheduled for 2006 [Taccetti et al., 2003]. This short survey shows the variety of problems that have emerged in attempting to exploit fusion power. It is at the same time scary and also indicative of the magnitude of this effort. Figure B.18. FRC propulsion concept from [Chapman et al., 1989]. flowing along open field lines is mixed with propellant (see Figure B.18). The design was largely based on the conceptual design of the land-based power plant SAFFIRE [Miley et al., 1978]. The example considered in Chapman (1989) foresees the use of a 5 T magnet and an 80 m3 plasma volume with a plasma radius of 1.5 m. A confinement time of 2 s and a plasma beta about 76% are envisaged to produce fusion power at a level of 0.5 GW. Note that the parameter S for such a configuration would be around 50, well above present values. More recently, a colliding beam fusion reactor (CBFR) space propulsion system has been proposed [Cheung et al., 2004] and is shown in Figure B.19.